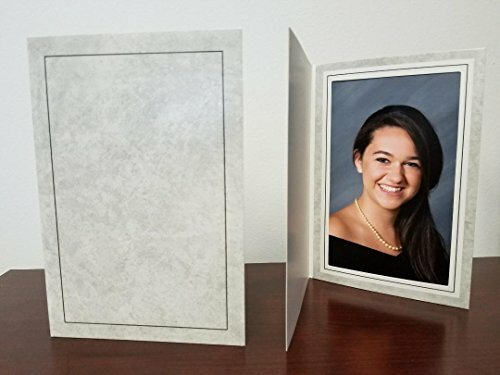 Cardboard Photo Folder Frame for 4x6 inch Pictures, Marble Gray (400 PACK). Traditional Grey Photo Mounts for 4x6 VERTICAL prints. Ideal for school pictures, photo studio & event photographers. PACK OF 400 PHOTO FOLDERS. Holds 1 photo per folder.Traditional GRAY MARBLE COLOR Photo Folder Frame for 4x6 vertical photo prints.Quick load from top or bottom. Outside dimensions (when folded): 4 1/4 " x 6 1/4 ". Made with sturdy cardstock material.Perfect for all kinds of events and school photographers... STC brand (trademark). Exclusive by EVENTPRINTERS. Traditional GRAY MARBLE COLOR Photo Folder Frame for 4x6 vertical photo prints. Quick load from top or bottom. Outside dimensions (when folded): 4 1/4 " x 6 1/4 ". Made with sturdy cardstock material. PACK OF 400 PHOTO FOLDERS. Holds 1 photo per folder. Perfect for all kinds of events and school photographers. STC brand (trademark). Exclusive by EVENTPRINTERS. If you have any questions about this product by Eventprinters, contact us by completing and submitting the form below. If you are looking for a specif part number, please include it with your message. Cardboard Photo Folder for 4x6" Picture. BLACK with GOLD Foil Border (PACK OF 400). Classic & Elegant! This 4x6 paper photomount is ideal for wedding, graduation and photo booth events. Archival Methods Onyx 12x16x2" Portfolio Box, 12.75x16-5/8", Black Buckram / White Lining.